Water is splashing again in the fountains in front of the Edwin J. Rousseau Centre downtown. It was water leaking into the building's basement that caused the fountains to be turned off, Mike Green, public information officer for Allen County, told The Journal Gazette's Rosa Salter-Rodriguez earlier this week. 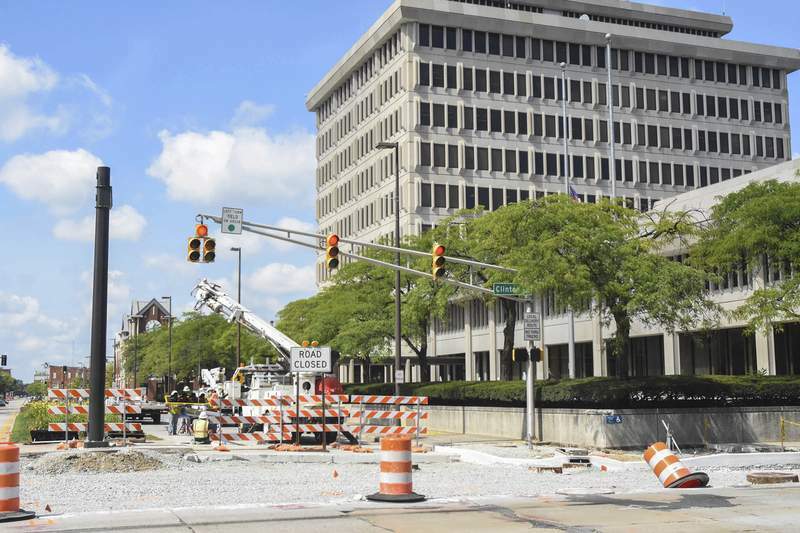 After a $2-million, year-long construction project that repaired and upgraded most of the plaza surrounding the former city-county office building, the fountains were tested several times last week and are now back on to stay, Green said. Unfortunately, the fountains are best viewed from Main Street – and motorists haven't been able to drive past the Rousseau Centre for a month. An Indiana Department of Transportation project to resurface parts of Clinton, Lafayette and Spy Run created disruptions at several intersections – including Main Street – for 100 feet in both directions, according to Frank Suarez, spokesman for City Utilities. The work was to have been completed this week, but it's not. And that means limited access and restricted views of the giant fountains at Freimann Square as well. You can blame heavy August rains for most of the delays, said Nichole Thomas, media relations director for the Fort Wayne District of INDOT. “Sidewalks and curb ramps go down first because you lay the asphalt over it,” she said. And because concrete has to cure for up to 72 hours, you need several days without threat of rain to pour it, Thomas added. That means it will be at least the end of next week before the current work is finished and then, she said, crews will begin working on the other side of the street. So, Main Street downtown will remain closed to through traffic until middle or late September, she estimated. But you can still access Headwaters Park, where this weekend's annual Labor Day Picnic will include free food, drinks, music, kids activities and – yes – the fountains. The water feature at Headwaters had been dry until late Friday afternoon. Geoff Paddock, executive director of the Headwaters Park Alliance, said the splash pad was damaged by a truck removing midway rides from the Three Rivers Festival, and a sensor in a water refill valve also had to be replaced. Finding parts for the Headwaters fountains – now 22 years old – is getting harder, Paddock said, but the valve arrived Thursday morning and was installed just in time for this weekend's festivities and temperatures in the upper 80s. The Headwaters fountains are expected to be active at least through the Middle Waves Music Festival in mid-September. Reminded of the approaching two-day music and arts fest, which draws thousands to three stages on both sides of Headwaters, Thomas said she would be contacting organizers to discuss the best ways to navigate the construction projects. Middle Waves is the last big event planned for Headwaters before the fountains will need to be winterized. And nobody wants to think about that yet.